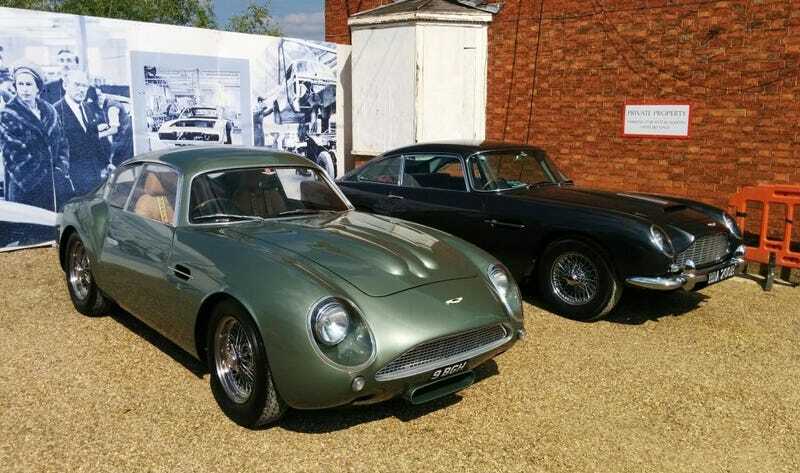 This past Saturday was the annual Bonhams classic car auction and AMOC knees-up at the Works Service in Newport Pagnell, Buckinghamshire, England. As usual, I conspired to drag the kids there for a nose around the various interesting (and in many cases very valuable) cars parked around the venue. We also invaded the showroom so that my offspring could jump in and out of the new cars and try to avoid inflicting £200k's worth of damage. Export 56, an importer, restorer and seller of old Porsches is based next door at Tickford House, and they made sure to have a driveway of interesting cars to pore over. I had fun, and the kids were very patient with me, so that was nice. As I wasn't wearing tweed and/or red trousers, I clearly wasn't sufficiently moneyed to actually get into the auction itself (they've tightened up security since the last time I just walked in), but Aston Martin, it's associated Owner's Club, surrounding businesses and general wealthy car enthusiasts make Newport Pagnell an interesting place to visit one day in May each year. You'd probably find interesting things to see the rest of the year too, but this is peak car day. Apologies for the poor image quality. I used a Google-Potato as I had left my camera at home.